A celebration of the textile heritage of India, Afghanistan, Bhutan & Nepal. His pictures are classic expressions of timeless moments. Gerardo captures this stillness in middle of the night in metropolis of Buenos Aires, full of beauty and in the absence of people. 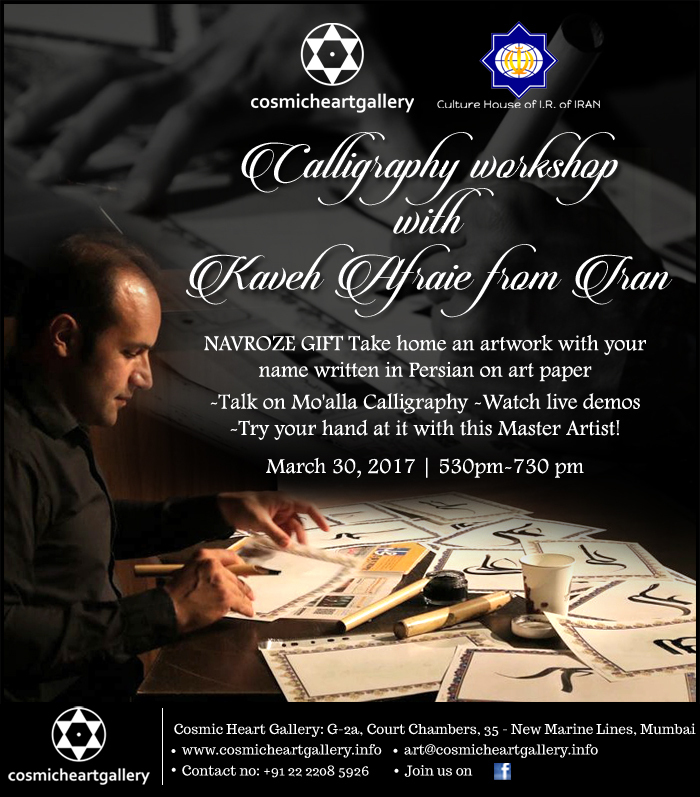 Alison Pinto, Anita Anand, Kaveh Afraei, Mahdi Farroukhi, Natasha Lalla, Pablo Ramirez Arnol, Philip Tongji, Raja Ravi Varma Oleographs, Minakari Artefacts by Iran Culture House, Angels by Soojata Kapoor, Mandalas by Soulscapes amongst others. Cosmic Heart Gallery supports Power of Pink. Cosmic Heart Gallery has been invited to participate at the prestigious Art Bahrain Across Borders 2019, which is Bahrain’s International Art Fair from March 6th to March 10th under The Patronage of Her Royal Highness, Princess Sabeeka Bint Ibrahim Al Khalifa, Wife Of His Majesty The King Of Bahrain, President Of The Supreme Council For Women. The theme of this fourth edition of the Middle East’s youngest and most promising art fair is ‘Legacies’ which will explore the nearly 50 year-old Bahraini contemporary art scene and its foundation in the Kingdom’s rich art heritage. ArtBAB (https://artbab.com/) is designed as a conversation between Bahrain’s artists and the rest of the art world. It has forged a unique identity for itself, as a marker of the Kingdom’s contemporary history as seen through the prism of art. Valentine event Palladium Chennai is turning one. The celebrations include a unique fusion of Art & Dance. Four shades of love of Meera, Radha, Yashoda & Sudama with Krishna depicted beautifully by renown dancers Neha Banerjee, Indu Nidheesh, Kalashri Lata Surendra ji & Dr Sailaja Desai. Artism, aka Art for AUTISM, an entrepreneurial calling and foray into the fine arts. A few months ago Kainaaz Master came across a video on ‘paint pouring’. Intrigued, she went on to explore the fascinating world of colours. With a little canvas and some student-grade paints, she embarked upon her obsessive journey into the world of art. Simultaneously, artist was involved in a quest to find her beautiful 8-year-old boy the perfect school and the right center for his therapy. With every session she paid for, with every penny she spent, she realised that there is a less fortunate parent out there who can’t afford to help their child and it broke her heart just to think about it. Every little kid deserves the chance to live up to his / her greatest potential and no parent should ever feel that they weren’t able to give it their all. It was this very thought that gave birth to Artism. For every piece of art artist create and sell, the proceeds will go to charity for autistic children. We looking forward to seeing you all. Let this be your 2019 Resolution: Pay it forward and buy art with a soul...Artism. Cosmic Heart Gallery & Consulate General of Argentina presents a collection of contemporary, abstract art byThomas Francis. Thomas Francis’s journey with colourful geometrical works has a profound connection with harmony & love, each telling a story, as he plays with various moods and elements of composition. 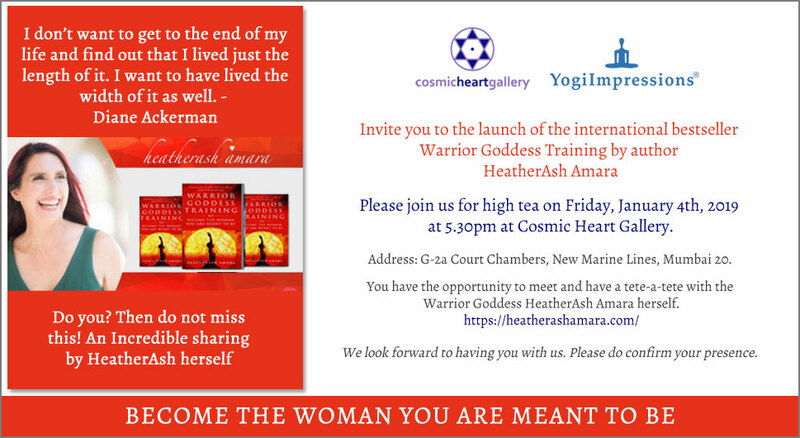 Cosmic Heart Gallery and Yogi Impressions are hosting the book launch of the international bestseller Warrior Goddess Training by author HeatherAsh Amara. The 52nd World Congress of Dance Research was organised by the Dadar-Mumbai Section of the International Dance Council in collaboration with Secretariat, Athens & CID Headquarters Paris affiliated with UNESCO . The festival was curated by the Section President Lata Surendra. The event was the great success with an array of dancers from across the world, amazing conversations, outstanding presentations and stunning performances. The 52nd World congress had Dr. Constantin Kontogiannis as the representative from Paris. The event was held at various venues at Mumbai like the Royal Opera House, NCPA, Taj Mahal Hotel, Iskcon Juhu. The presiding guest was The first Lady of Maharashtra Hon Amruta Fadnavis. Pandit Birju Maharaj graced the occasion. Jayati Bhatia was amongst the special guests. Jalpa H Vithalani, Creative Head & Director of Cosmic Heart Gallery presented a paper on ‘Receiving to give and giving to receive’, The Harmonious cycle of the visual and performing arts, Diego Marin from Mexico on Dance for everyone, a co-operation project for the welfare of vulnerable communities, Anuraj Chauhan from Humans from Humanity presented a paper on the Art of an artist, Smita Glk Parikh, Director Lit-o-Fest on Dancing a word, among others. There were fantastic workshops conducted by Peter de Grasse & J.J. Gregg from USA on Malkauns Meditation, by Fiona Gardner from Australia on Contact Improvisation - The basic power of touch, Ashley Lobo, Director of the Dance Worx. Dr. Raghunath Manet from Paris on the Dance of Shiva, among others. It was an amalgamation of many cultures and it was prestigious for Mumbai to host this International Congress. Each delegate enhancing and defining dance as a bridging metaphor! 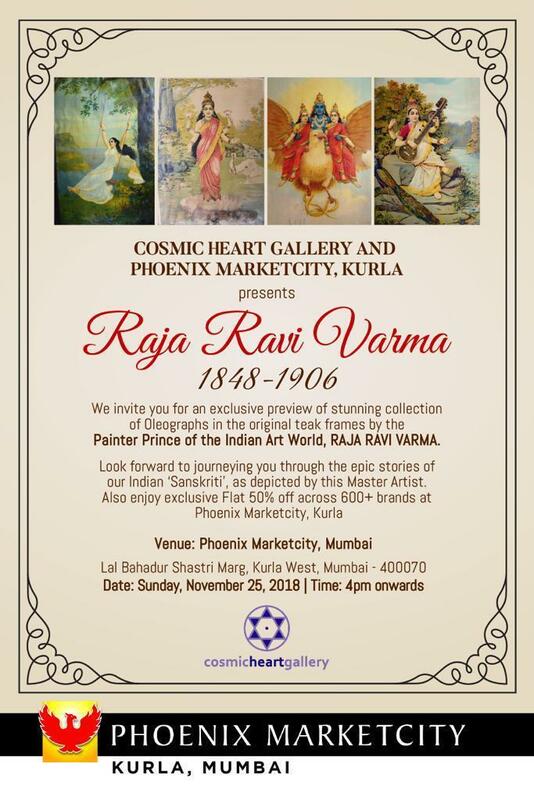 Cosmic Heart Gallery in association with Phoenix Marketcity Kurla, presents a beautiful collection of Oleographs by the Painter Prince of the Indian Art World, Raja Ravi Varma. •	Jalpa H Vithalani, Creative Head & Director of Cosmic Heart Gallery journeyed the audience through the history & rich legacy of Raja Ravi Varma. •	Scintillating Dance Performance bringing to life the Art/ Oleographs by the disciples of Sandhya Purecha, Sangeet Natak Akademi Awardee. The moon is going to make an artist out of you. Come, meditate with us and set loose all those creative ideas that have been brewing inside you. Join in for this delightful creativity-boosting meditation guided by Radhika Deshpande. Creative Head & Director of Cosmic Heart Gallery, Jalpa Vithalani will journey you through a beautiful collection of art by Natasha Lalla who paints in a plethora of colours. She is one in a million artists who paints with her fingers and does not own a brush. Kalashri Lata Surendra ji partnered with Smita Parikh - Founder of Lit-O-Fest, Jalpa H Vithalani – Creative Head, Cosmic Heart Gallery and Phoenix Market City to birthe a unique festival.. In a bid to keep the torch of Indian traditions burning bright in this modern world, it was time for Ekam 2018- “Awaken Your Inner Sky” a two day festival at Phoenix Market City, Kurla to gather oneness through the synergies of painting, literature & performing arts. Presenting Shailan Parkar’s journey with light. A lucid pool of light in the hands of the photographer. An alluring collection of photography art, which is a tactile exploration of nature. The artist’s spontaneous expression results in conscious and stunning abstract imagery, as the light revolves and the story evolves. Jalpa H Vithalani has been invited to represent Business and Professional Women of India at the BPW International Annual Leaders Summit held at the United Nations Headquarters in New York from 9 March to 15 March, 2018. She is the President of BPW Mumbai. A confluence of art, ideas & sentiments translated powerfully by the masters in making..
Showcasing the works of Anil Chouhan, Chandrakant Halyal, Chetan Pashilkar, Divya Ramrecha, Prakash Gaikwad, Prof. Vishwanath Sabale, Ramdas, Rutuja Divekar, Suraj Lohar & Vaishnavi Naik. BMW Infinity Motors, Shital Mehta & Manoj Gursahani presents Anil Barwani's Fine Jewellery preview and Art walk of Natasha Lalla creations curated by Jalpa Vithalani. Inaugurated by Nawaz Modi Singhania - India's leading FItness & Lifestyle Icon, Founder Body Art Fitness Centers. Chief Guest Saroja Sirsena, Sri Lankan Consul General. Hosted by Shital Mehta, Manoj Gurusahani. Guest of Honour Maropene Dirupzele Ramokgopa, Consul General of South African. Deputy US Consul General - Jennifer Larson. Royal Opera House, Mumbai and Cosmic Heart Gallery present a one of its kind rhythmic and immersive performance 'Music of the Mystics' by Fanna-Fi-Allah, the only non-Asian Qawwali ensemble devoted to spreading the Sufi message in the West. Performance by: Geoffrey Lyons- Tahir Bhai, Jessica Lynn- Aminah Chisti, Davananda Rubin - Lali Qalandar , Shankar Shankar, Pascal Hudon- Salim Bhai and Andre Vincent Preece- Ali Shaan. Sufi Art Walk curated presenting Radhika Seksaria;s Whirling Dervishes. MAKE IN INDIA curated by talented Sonia Mayers and legendary Kalashri Lata Surendraji (Guru of Aishwarya Rai Bachan). A kaleidoscope of folk and classical dance forms showcasing the colors of Maharashta and culminating in a unique fashion show along the Swadeshi Runway. Over 150 dancers of various styles will perform at the inauguration ceremony unfolding at 1 pm on December 22, 2017. - Neha Banerjee, Mrs World 2017, Jalpa H Vithalani, President, BPW Mumbai & Creative Head, Cosmic Heart Gallery, Mr Anil Morarka, Philanthropist. Founder of Danceworks Performing Academy. Ashley Lobo, Padmashri Darshana Jhaveri, renowned Manipuri exponent. Cosmic Heart Gallery has created a special canvas for Colors of India...come join us and immerse in this beautiful journey of dance, art and music with us. Spreading awareness - Art Competition for the Disability week celebrations by Om Creations. Ms. Jalpa Vithlani of Cosmic Heart & Ms Nirupama Khandke, President Rotary Club of Bombay Central judged the competition and handed over award certificates to the young winners of our art competition- SEE THE ABLE & NOT THE LABEL. BE Publication had organized WOW MISTER AND MISS CULTURE ICON clubbed with WOW PERSONALITY AWARDS at Eskay Club, Borivali on 9th December 2017. The event had young contestants from all over India. The personality contest was judged by celebrities like Smita Jaykar, Sandip Soparrkar, Jalpa Vithalani, Dipannita Sharma, Mitali Nag, Parul Bindal, Dharasingh Khurana, Corina Manuel, Shubh Malhotra, Dr Uma Rele, Neha Banerjee and among others. The founder of BE Publication and WOW Awards has always supported women empowerment and provided a platform for young talent from all walks of society. Some of the recipient of awards were Haresh Shah, Director MAD Foundation, Anu Mehta, Director MetaHealth, Doctor Uma Rele, Director Nalanda Foundation, Sandip Soparrkar, International acclaimed choreographer and Jalpa Vithalani, President BPW (Business and Professional Women) Mumbai. OM CREATIONS TRUST is a pioneering training centre for holistic and educational rehabilitation of mentally-challenged women in the age group of 20-60 years. Their centre in Mumbai at the King George V Memorial compound at Mahalaxmi comprises of 60+ ‘special’ women who have gone through arduous training in ‘Arts & Crafts’ and ‘Hospitality & Catering’. These cognitive and specially challenged ladies work under trained supervision and create lifestyle products, pieces of art & sculpture, and delicious fare. These women have achieved a sense of self-worth and dignity through these endeavors. December 3rd was World Disability Day. Om Creations Trust are commemorating this with an Annual Celebration 'TRISOMY 21 - 21 days of Awareness' from 27th Nov - 17th December. Jalpa H Vithalani, Reconnective Healing Practitioner from Cosmic Heart Gallery had been invited to conduct a special workshop on Reconnective Healing on December 8, 2017, as a part of these celebrations. In collaboration with Kriti Gallery, Banaras. Integrative health fitness and wellness company with the sole aim of helping people in India stay healthy! BPW International is the biggest organization in the world empowering and promoting women in more than 100 countries. In collaboration with Consulate General of Argentina. Jalpa H Vithalani is a Reconnective Healing Foundational Practitioner and Reconnection-Certified Practitioner. 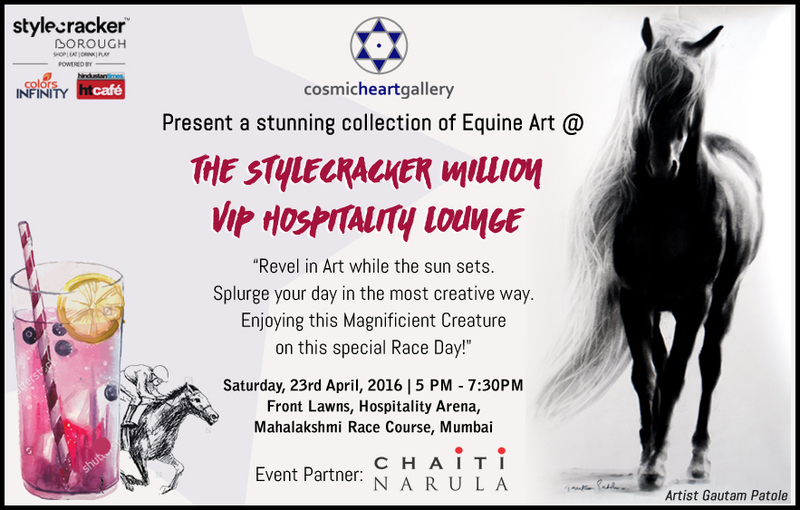 She is the Creative Head & Director of Cosmic Heart Gallery, Mumbai and the Director of Global Agritech (I) Pvt Ltd. Furthermore, she is also the Vice President of Western India Floriculture Association. With more than 7 years of experience, she has been associated with close to 3000 Reconnective Healings. A Glimpse of her ongoing journey is documented in a film, which was showcased worldwide on Reconnective Healing Global Awareness Day. Bliss Equity’s Shobha Arya’s Publication, announces WOW Women's Excellence Awards for the strong and empowered Women who are greatly contributing to the Society every year. First Lady of a Maharastra, Amruta Fadnavis (Wow Outstanding Multifaceted Woman of the Year), Jalpa Vithalani (Excellence in Reconnective Healing) & Toral Vithalani (Founder- Ishayas, Spiritual & Healthcare centre) were felicitated as Winners of Worthiness. Jalpa H Vithalani had a exclusive meeting with the Honourable Chief Minister, Shri Devendra Fadnavis, Shri Amruta Fadnavis and Mr. Girish Mahajan, Minister of Water Resources and Medical Education at Varsha, Maharashtra Chief Minister's Residence. Some of the other Awardees included Dr Uma Rele, Founder, Nalanda Dance Research Institute, Designer Kanwaljeet Singh, Actor Jayati Bhatia, Tarminder Manchanda,CEO, Serenity Crystals, Social Activist Gurpreet Kaur Chadda, Sandeep Soparkar, Pioneer in Latin & Ballroom dancing, among others. Group drumming has immense benefits. When a group of people play a rhythm for an extended period of time, their brain waves become entrained to the rhythm and they enjoy a shared brainwave state. It is really the oldest Holy Communion! Designed to put you into a state of complete balance and harmony. 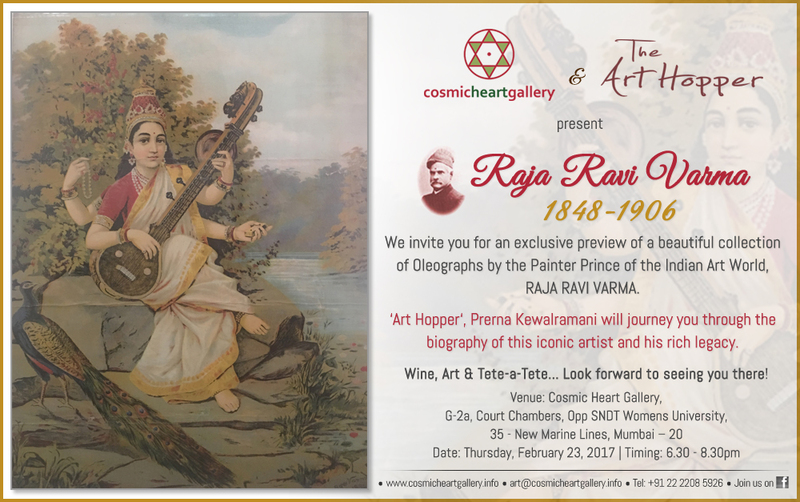 An exclusive event on January 15, 2017, where 'The Art Hopper', Prerna Kewalramani will journey you through the biography of this iconic artist and his rich legacy. Princess Divya Kumari inaugurates and tours Jaipur Art Summit featuring Art from 25 countries across 7 continents watch this video. Dr. Eric Pearl in Mumbai! LA DEVI, Global Agritech, Lotus Sutra & Reconnective Healing. Jalpa H Vithalani, Creative Head & Director, Cosmic Heart Gallery presented a beautiful potrait by artist Gautam Patole & Mandala by Vivechana to His Holiness Dalai Lama. His Holiness has blessed the gallery and its journey of spreading the message of love and peace with the medium ot art. Haji Syed Salman Chishty, Director, Chishty Foundation. 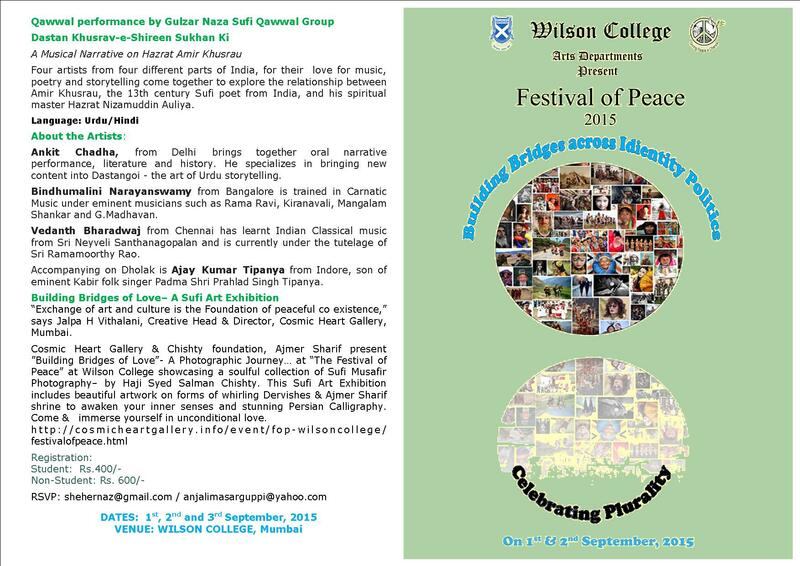 Ajmer Sharif & Cosmic Heart Gallery, Wilson College. The Divine Matrix of the Heart through L.O.V.E. limestone in archival UV ink by Rashme Mehta. NIRANKAR - A journey through dimensions. -Expressing the Music of the Soul!